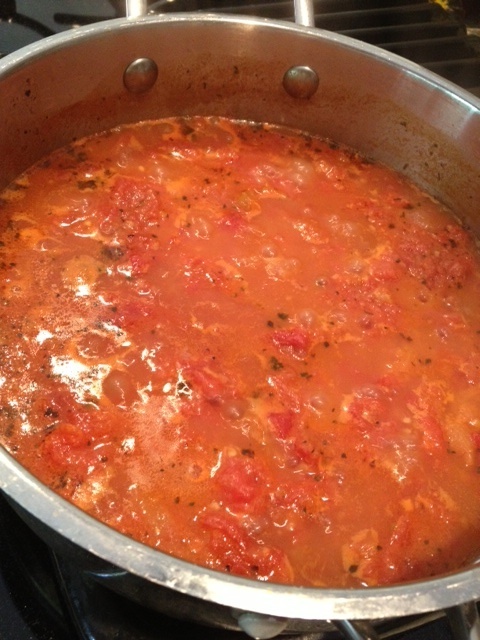 At the end of summer, just as the nights turn crisp and mums multiply, I make my ceremonial sauce. Forty juicy tomatoes that’s what it takes. Trial and error has gone into that number. It’s enough to make sauce for two meals with some left over for the freezer. After all, these are not just any tomatoes. They are tomatoes from the garden. This morning as I poured over the past prime plants, picking the late blooming tomatoes, I felt the familiar struggle of the changing season. In the garden, in me. My practice plot has come to mean much more to me than the produce it provides. I've learned a lot, over the past few summers, in the garden. Space. Plants, like people, need space. When they are crowded they either get power hungry or topple from the weight of others around them. Balance. (Yes I’m talking to you summer of 2013!) Plants try to acclimate to extreme conditions, but at the end of the day a little sun and a little rain produces the best yield. Too much of either and everything drowns or cracks. Especially tomatoes. Timing. Never water in high heat. The water bakes the plants and makes everything droopy. It’s the same as trying to reason with a tantrum throwing toddler in a grocery store. Let the intensity subside, and things will work out just fine. Imperfections. Get rid of weeds before they’ve fully taken root. If you wait too long, it can be difficult to tell which is the plant and which is the weed. After a certain point, it’s better to have some weeds growing side by side with the plants than to kill the vegetables trying to destroy the interloper. And sometimes, it turns out, the plants and weeds grow just fine, together. Freedom. Let plants roam. I try to plan out the flow of the garden so that the rambling summer squash vines don’t invade the more controlled eggplants and tomatoes but in the end, the plants do what they want. I gently nudge them and tie them together on sticks and cages. Plants like people need direction, support. But don’t give them too much instruction. They’ll find the warmth they need, after they figure out which path is best for them. Share. 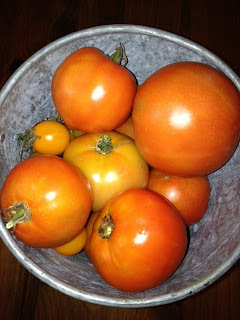 There is nothing like the taste of juicy homegrown tomatoes or the tangy punch of garden leeks except the glory of sharing something you’ve grown with a friend. Letting Go. There is no perfection in the garden. I love getting my fingers dirty, tending the baby plants, sowing the growing fruit. But it isn’t orderly or pretty. I am usually a sweaty, buggy mess after I’ve spent time in the garden. And despite my best efforts in May to pristinely plant seeds in perfect rows, by July the garden is a twisty, twirly magical mass of green, ready to burst with the season’s bounty. Then just a few short weeks later, the vines wither, the fruit is picked, and even the weeds grow weary. Summer ends. And that’s when I make my ceremonial sauce--to remember--summer in the garden. The sauce is beautiful and so is your writing! I'm so tempted to grow my own after reading about your experiences, but then one glance at my orange thumb and I realize I should just live vicariously through you. Looks delicious!